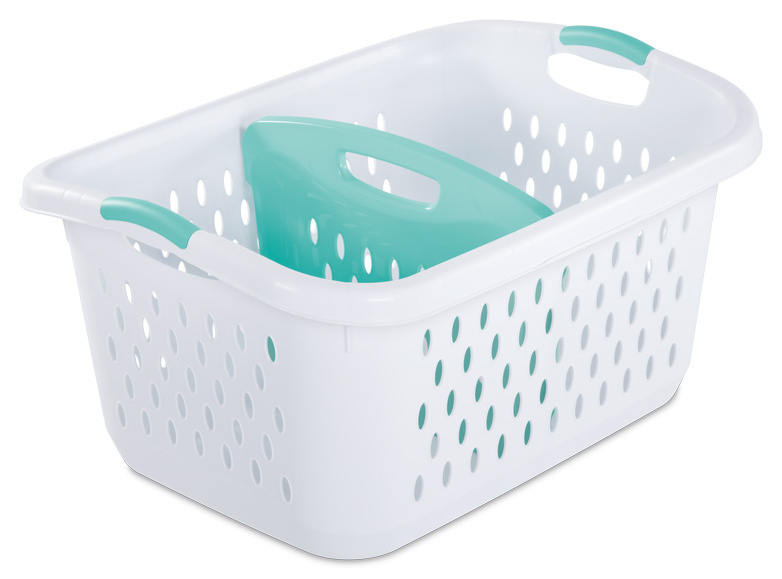 Laundry will be less of a chore with the 2.2 Bushel Divided Laundry Basket. This laundry basket combines innovative functionality with a fashionable aesthetic and is ideal for use throughout the home. It features a dividing panel that can separate whites from colors and makes the chore of doing laundry exceptionally simple. The divider can be installed in any location within the basket, resulting in a customized laundry solution for any size load. When not in use the divider can be neatly stored in the bottom of the basket. 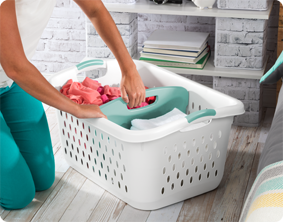 This feature also ensures that clean clothes remain organized within the basket, particularly when completing laundry for multiple family members. The overall dimensions of this item are 26 3/4" L x 20" W x 13 5/8" H.
Overall Assembled Size: 26 3/4" x 20" x 13 5/8"
Ideal for sorting the whole family's laundry. 2.2 Bushel Divided Laundry Basket is rated 5.0 out of 5 by 6. Rated 5 out of 5 by shaysies from High School Grad Gift We gave this basket as a gift for a High School grad going to college, and it is absolutely amazing! With the divider in, it is still a strong quality of plastic and can hold approximately 2 loads of laundry. The grad loved it! Rated 5 out of 5 by sspencer13 from Great to use to divide colored clothes I am pleased to own the Sterilite Divided Laundry Basket. It is very sturdy and well made. It has a nice removable divider in the center that is useful to divide colored clothes or any clothes you want to separate. It is a large size basket which I had some difficulty maneuvering out my bedroom door but carrying it is very easy. I really like the color, shape and weight which is not heavy at all. Rated 5 out of 5 by Monkeysad from separate wet from dry This is a very useful and durable product. Very sturdy, does not bend easily but is very light weight. The divider is not in a set position and allows you to adjust to size of load you want to separate from each other or if you wish you can take out altogether. I found it useful for keeping wet and heavily soiled clothes away from each other. Good depth and width for sizable holdings. Is also good for keeping delicate fabrics sorted for a different load. Great quality and realistic benefits come into play with this design. I highly recommend. 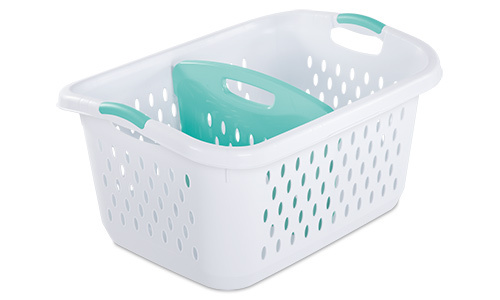 Rated 5 out of 5 by snowflake from Perfect for all laundry This is a great size, weight and shape for a laundry basket. I love the divider, which can be removed. With the divider in you can keep laundry separate which makes it so easy to transport to other rooms and easy to disperse in the rooms without having to go through every item. The divider is great for keeping wet and dry laundry separate, clean and dirty away from each other. It is also great for keeping colored and whites separate which really makes it easy when you are ready to do laundry.....no having to separate because the laundry will already be separated. It is easy to carry and is firm yet flexible for moving about. I highly recommend and have enjoyed the benefits of the divided laundry basket. Rated 5 out of 5 by lauradollc from Excellent laundry basket! This is a very handy laundry basket. It is durable and has a divider to separate your clothes whether you are taking them to the laundry room or folding them into neat stacks. The divider makes this easy!